Name Meaning "House of Lambs"
This article is about the city in the West Bank. Bethlehem (Arabic: Bayt Lahm meaning “House of Meat” and Hebrew: Bet Lehem meaning “House of Bread”) is a Palestinian city in Israel's West Bank and a hub of Palestinian cultural and tourism industries. It is home to one of largest Palestinian Christian communities in the Middle East. Bethlehem lies 6 miles (10 km) south of Jerusalem, standing at an elevation of about 765m above the sea, thus 30m higher than Jerusalem. The Bethlehem agglomeration also covers the small towns of Beit Jala and Beit Sahour. The latter has biblical importance as the reputed site of the "Shepherds' Field." The city has great significance to the Christian religion as it is believed to be the birthplace of Jesus of Nazareth. 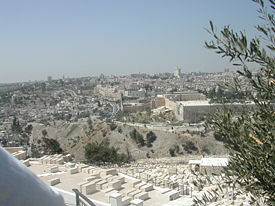 The traditional site of Rachel's tomb, which is important in Judaism, lies at the city's outskirts. The Church of the Nativity, built by Saint Helena, mother of Constantine the Great (330 C.E. ), stands in the center of Bethlehem over a grotto or cave called the Holy Crypt, which according to Christian tradition, is the place where Jesus was born. This is perhaps the oldest existing Christian church in the world. A monastic center for centuries, nearby is the grotto where Saint Jerome the Latin father and Doctor of the Church, is said to have spent 30 years of his life translating the Scriptures into Latin. Some researchers dispute the authenticity of this town as Jesus' birthplace, supporting instead a town of the same name in Galilee. However, for two thousand years Christian tradition has sanctified Bethlehem of Judea as the holy birthplace. The city of Bethlehem, located in the "hill country" of Judah, was originally called Ephrath (Genesis 35:16, 19; 48:7; Ruth 4:11). It was also called Beth-lehem Ephratah (Micah 5:2), Beth-lehem-judah (1 Samuel 17:12), and "the city of David" (Luke 2:4). It is first noticed in Scripture as the place where Rachel died and was buried "by the wayside," directly to the north of the city (Genesis 48:7). The valley to the east was the scene of the story of Ruth the Moabitess. There are the fields in which she gleaned, and the path by which she and Naomi returned to the town. Here was David's birthplace, and here also, in after years, he was anointed as king by Samuel (1 Samuel 16:4-13); and it was from the well of Bethlehem that three of his heroes brought water for him at the risk of their lives when he was in the cave of Adullam (2 Samuel 23:13-17). The town was fortified by Rehoboam, David's grandson and first king of Judah after the division of the state between Israel and Judah (II Chronicles 11). Bethlehem, however, is distinguished above every other city as the birthplace of "Him whose goings forth have been of old" (Matthew 2:6; comp. Micah 5:2)—Jesus the Christ. Afterwards Herod, "when he saw that he was mocked of the wise men," sent and slew "all the children that were in Bethlehem, and in all the coasts thereof, from two years old and under" (Matthew 2:16, 18; Jeremiah 31:15). The city was devestated during Bar Kokhba's revolt, (the Second Jewish Revolt) of 132-135 C.E., with the Romans setting up a shrine to Adonis on the site of the Nativity. Only in 326 was the first Christian church constructed, when Helena, the mother of the first Christian emperor, Constantine, visited Bethlehem. 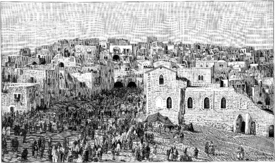 During the Samaritan revolt of 529, Bethlehem was sacked and its walls and the Church of the Nativity destroyed, but they were soon rebuilt on the orders of the Emperor Justinian. In 614, the Persians invaded Palestine and captured Bethlehem. A story recounted in later sources holds that they refrained from destroying the Church of the Nativity on seeing the magi depicted in Persian clothing in one of the mosaics. In 637, shortly after Jerusalem was captured by the Muslim armies, the Caliph Umar ibn al-Khattab visited Bethlehem and promised that the Church of the Nativity would be preserved for Christian use. In 1099, Bethlehem was captured by the Crusaders, who fortified it and built a new monastery and cloister on the north side of the Church of the Nativity. Until that time, the Official Christian presence in the Holy Land had been Greek Orthodox, who were removed from their Sees and replaced with Latin clerics. The town prospered under their rule. On Christmas Day 1100 Baldwin I, first king of the Frankish Kingdom of Jerusalem, was crowned in Bethlehem, and that year a Latin episcopate was also established in the town. In the 1160s the nave of the Church of the Nativity was redecorated with mosaics showing the councils of the church. An ally of King Amalric I of Jerusalem, emperor Manuel I Comnenus of Byzantium, was one of the patrons of the work. On the south wall, an inscription in Greek reads: "the present work was finished by Ephraim the monk, painter and mosaicist, in the reign of the great emperor Manuel Porphyrogenitos Comnenus and in the time of the great king of Jerusalem, Amalric." Interestingly, the emperor's name was placed first, in recognition of his role as overlord and protector of the Crusaders at the time. In 1187, Saladin captured Bethlehem from the Crusaders, and the Latin clerics were forced to leave, while the Greek Orthodox clergy were allowed to return. Saladin agreed to the return of two Latin priests and two deacons in 1192. However, the town suffered from the loss of the pilgrim trade. Bethlehem was briefly returned to Crusader control by treaty between 1229 and 1244. In 1250, with the coming to power of Rukn al-Din Baibars, tolerance of Christianity declined, clergy left the town, and in 1263 the walls of the town were demolished. The Latin clergy returned to the town over the following century, establishing themselves in the monastery adjoining the Basilica, whose control they shared with the Latins and the Armenians. In 1347 the Franciscans gained possession of the Grotto of the Nativity as well as the right to administer and maintain the Basilica. During the years of Ottoman control from 1517 on, custody of the Basilica was bitterly disputed between the Catholic and Greek Orthodox churches. From 1831 to 1841 Palestine was under the rule of Muhammad Ali of Egypt. During this period the town suffered an earthquake as well as the destruction of the Muslim quarter by troops, apparently as a reprisal for a murder. In 1841, Bethlehem came under Ottoman rule once more, and so it remained until the end of the First World War and the imposition of the British Mandate on Palestine. In the 1947 resolution by the United Nations General Assembly to partition Palestine, Bethlehem was included in the special international enclave of Jerusalem to be administered by the United Nations. Jordan occupied the city during the 1948 Arab-Israeli War. Many refugees from areas captured by Zionist forces in 1947-48 came to Bethlehem, establishing encampments in the north of the city near the road to Jerusalem and on the hillside to the south between the city and Solomon's Pools. These later became the official refugee camps of Beit Jibrin (or al-'Azza) and 'A'ida (in the north) and Deheisheh in the south. This influx of refugees changed the demography of Bethlehem considerably, changing the Christian majority into a minority. Jordan retained control of the city until the 1967 Six-Day War, when Bethlehem was captured by Israel along with the rest of the West Bank. On December 21, 1995, Bethlehem became one of the areas under the full control of the Palestinian National Authority in conformance with the Oslo Accords. It is capital of the Bethlehem Governorate. The current population of the town is about 40,000. The Christian population isa decreasing minority, but a special statute requires that the mayor and a majority of the municipal council must nevertheless be Christian. Only six miles from Jerusalem, the two towns have been closely connected. A modern well-kept highway links the two. Bethlehem in recent times has been an agricultural and trade town. Long a destination of religious pilgrims, manufacture of religious articles, chiefly of mother-of-pearl items and the carving of olivewood, has been a traditional industry. 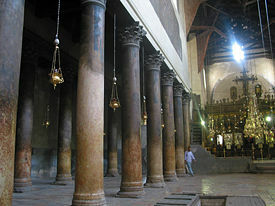 The Church of the Nativity as well as Rachel's Tomb are popular tourist sites. A large number of churches, convents, schools, and hospitals supported by Christian denominations from around the world exist in the city and its two suburbs, Bayt Jala, to the northwest, and Bayt Sahur, to the southeast. With the escalation of the Israeli-Palestinian conflict, Bethlehem has been the site of many confrontations and its tourist activity has been at a near standstill, especially since the time of the Second Intifada. From March to April 2002 Israeli forces carried out “Operation Defensive Shield” in the West Bank. As a part of these large-scale military operations, Bethlehem was invaded in a declared effort to root out militants and end the terror. Following an Israeli air attack on April 1, Israeli tanks surrounded Bethlehem. The next day, Israeli tanks and troops entered the city, causing approximately 200 Palestinians to seek sanctuary from the forces in the Church of the Nativity. According to senior Tanzim commander Abdullah Abu-Hadid, the church was specifically chosen due to its abundant supplies of food, water, and as a focal point for international outcry. By early May, Bethlehem was the last West Bank city where Israeli forces were still present. The number of people inside the church during the five-week stand-off was estimated to be between 120 and 240 including at least 40 gunmen. Several groups of civilians were allowed out during the siege, and several Palestinians inside the church compound were shot dead by Israeli snipers. Many more were reportedly wounded. The siege ended with an agreement for 39 militants who had been wanted by the Israeli army to be removed from Bethlehem. Thirteen of them were to be sent via Cyprus to various European countries while the remaining 26 were sent to Gaza. The rest were set free. The IDF stated that 40 explosive devices were found and removed from the compound after the standoff was concluded. Bethlehem, Beit Sahour and Beit Jala are currently surrounded by Israeli checkpoints and roadblocks, with the main road to Jerusalem cut off at Rachel's Tomb. Bethlehem residents are only allowed into Jerusalem, the main social, economic and religious center of the region, with special permits whose issuance has become increasingly rare since the onset of the violence surrounding the al-Aqsa Intifada, though Israel has subsequently erected a terminal for the stated-aim of easing transit between the two adjoining cities. Travel to other parts of the West Bank is also impeded and sometimes prevented. After the Intifada's onset the city has periodically been placed under strict curfew, preventing residents from leaving their homes. Palestinians are not allowed to enter the Jewish holy site of Rachel's Tomb, which is on the outskirts of the city, without a permit. Since Bethlehem and the nearby biblical Solomon's Pools lie in Area A, Israeli citizens cannot go there without a permit from the Israeli military authorities. Restricted travel between Jerusalem and Bethlehem has caused great economic hardship on the city. Prior to the restriction, many of Bethlehem's residents worked in Jerusalem, while the city's restaurants were a favorite destination of many of Jerusalem's residents. The construction by Israel of the West Bank barrier has had a severe impact on Bethlehem. The barrier runs along the northern side of the town's built-up area, within metres of houses in 'A'ida refugee camp and the Jerusalem municipality. The barrier is a highly controversial project. Supporters assert that the barrier is a necessary tool for protecting Israeli civilians from Palestinian terrorism, including suicide bombing attacks, that increased significantly during the al-Aqsa Intifada; it has helped to significantly reduce incidents of terrorism from 2002 to 2005; its supporters assert that the onus is on the Palestinian Authority to fight terrorism. 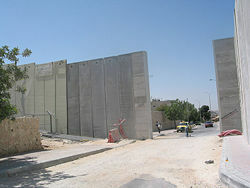 Opponents assert that the barrier is an illegal attempt to annex Palestinian land under the guise of security; violates international law; has the intent or effect to pre-empt final status negotiations; and severely restricts Palestinians who live nearby, particularly in their ability to travel freely within the West Bank and to access work in Israel, thereby undermining their economy. Some opponents claim that building and maintaining the wall is a crime of apartheid - isolating Palestinian communities in the West Bank and consolidating the annexation of Palestinian land by Israeli settlements. However, this is strongly disputed by others. Bethlehem's former mayor, Hanna Nasser, says an estimated 2,000 Christians residing in Bethlehem have emigrated during the period of 2000-2003. Fifty years ago, Bethlehem residents were overwhelmingly Christian. Today, it has a Muslim majority. Some researchers believe that these New Testament references actually relate to the town of Bethlehem in the Galilee, not to this town. Their reasoning is that the site featured the ruins of a church and a synagogue until the late nineteenth century, and was found to have archeological evidence of a prosperous city; many scholars place Beth Lehem of Galilee as one of the birth places of Rabbinical Judaism—it is by all accounts a logical place for a spiritual leader with a small group of followers to develop his doctrines. The distance from Nazareth also settles the problem of Jesus crossing the distance between the two cities in six hours according to the New Testament. Israeli archeologist Aviram Oshri of the Israel Antiquity Authority, who has excavated and mapped the site,  found solid evidence of a flourishing Jewish community at the site well before 1 C.E., and a wall built around the settlement later (though neighboring Jewish towns never built one). To some archeologists this is a sign of a separatist cult community of some sort, which probably feared the religious wrath of their neighbors rather than more enemies. In comparison, the Bethlehem area south of Jerusalem has never produced any archeological evidence of a town existing around 1 C.E., until the first Byzantine town in that area some time in the third century. The Judean Bethlehem location was the preferred mythical birthplace of Christ, backing up his lineage to King David. ↑ Sheera Frenkel, Dig Finds Evidence Of Another Bethlehem. NPR, December 25, 2012. Retrieved March 6,2017. Bible Places.com. Bethlehem Retrieved March 6, 2017. All links retrieved March 6, 2017. This page was last modified on 29 March 2017, at 16:18.